The Blonde Blogshell: And on Month 11, God said, "Let there be light"
And on Month 11, God said, "Let there be light"
Another link to my other blog. My next post here will be all the lights I loved but we couldn't get. 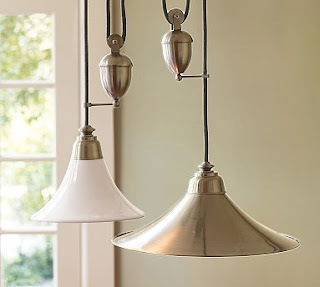 I love the Mason jar pendants and old lightbulb pendants too but I have ideas for them for outside! Enjoy the lighting update over at 1916 Bungalow Hell...Soon to be Heaven.